14500, 3.7 volt, IMR lithium ion battery made by Efest. The capacity of this battery is 700mAh. 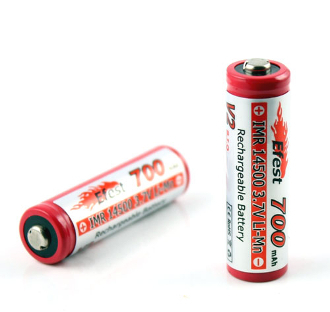 This battery can be used in electronic cigarettes that requires an 14500 cell. This IMR cell has a high discharge rate and is great in variable voltage electronic cigarettes that take an 14500 IMR.